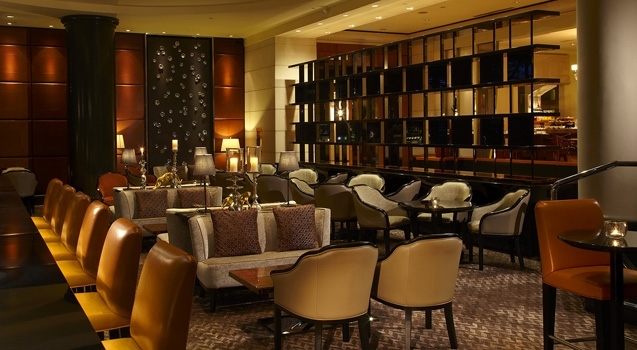 The Four Seasons hotel is a luxury five-star hotel and home to the One-Ninety Bar which claims to offer “afternoon tea with a twist.” What’s the twist we wondered? As we all gathered in the dimly lit bar ‘by’ Javier de las Muelas it felt as if we were there too early. Perhaps the creative partnership of Muelas serves its purpose well with martini’s flowing in the evening and a no doubt stylish crowd mingling amongst the spacious bar and outdoor area (they call this the Terraza). But, during the day it felt dark, heavy and too sombre. This is possibly a bar best seen at night. But there we were and afternoon tea is what we were after. The waitress gave us the menu and there was an impressive selection of teas to choose from. 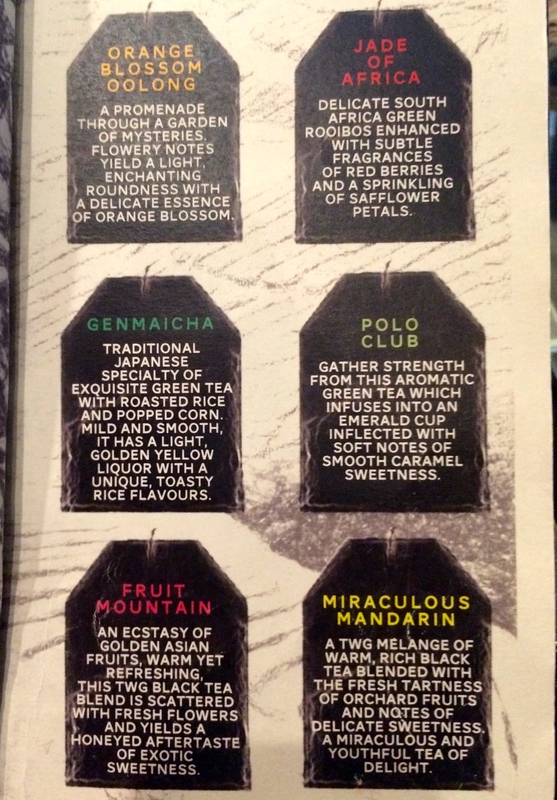 If you like fancy tea that is. For those of us who wanted a bog standard English Breakfast tea, or even an Earl Grey it seemed we were scuppered. Perhaps we should have opted for one of the amazing concoctions on offer; they certainly sounded delightful. We all agreed these teas sounded lovely, but were not what we wanted with our sandwiches and cakes. But, following a small panic by my mum – who was visiting from the UK and would win any award for tea drinking there is – we managed to get a pot of perfectly acceptable English Breakfast tea. She was happy. The rest of the tea drinkers were fairly conservative in their choices too with Earl Grey being the most adventurous. The coffee drinkers were well catered for too with latte’s, cappuccino’s and flat whites readily available. The traditional three-tiered stand was soon to arrive, carrying what looked like a delectable section of finger sandwiches, pastries and scones (oh or o, I don’t care!) There were salmon, cheese, ham and egg sandwiches to choose from. Nothing amazing in the fillings and not really what you’d expect from a five-star hotel but they tasted fine so no complaints. The tiered stand looked very pretty with its glass cups of strawberry mousse perched on top and macaroons nestled next to tiny little chocolate and raspberry bites, as well as some quirky champagne flute shaped cookies. There were also some rather large cupcakes brimming with fondant. Of course the obligatory – in our opinion – scones were there with small dishes of clotted cream and jam to accompany them. It all looked pretty good. But, and it’s a but that needs to be butted. It all looked lovely. But tasted – meh! Nothing blew any of us away. The macaroons were ok; they had a nice pistachio taste but were no deal breaker. The mousse was pretty bland, the chocolate and raspberry bites had those awful silver balls on top that you find on kids cakes that can break your teeth. The cupcakes were all show really. Even the champagne flute cookies weren’t particularly tasty. In fact, the icing on top also smacked of a children’s party. Again, not what you’d expect from a five-star hotel. The scones were ok, not too dry and had some fruit inside, but nowhere near enough jam or cream is provided. In fact, had we not all been such a polite bunch, a fight could have broken out over who had too much cream. According to the website there is a show pantry “with a variety of exquisite pastries.” We weren’t told about or shown this and certainly didn’t get offered anything from anywhere else. We were also not offered more than one pot of tea, which is poor. Although had we asked, I’m sure they would have accommodated. Unfortunately the staff weren’t that easy to find so top ups were not really an option. Some of our group opted for the additional $20 for a cocktail, and for $30 you can go for a glass of champagne with your afternoon tea. The standard afternoon tea was $42 – this seems a fair price for the quantity of food and is pretty average for Singapore. Overall, the company made the afternoon worthwhile. Everyone felt they had got their money worth and although disappointed with the flavour of the food that day, the look of it was lovely. But, the afternoon tea was just a sideline really; never the star of the show, which is a shame. What, when, where, how much? $42++ per person. More for cocktails and champagne. * Maybe the twist is the ridiculously long name?